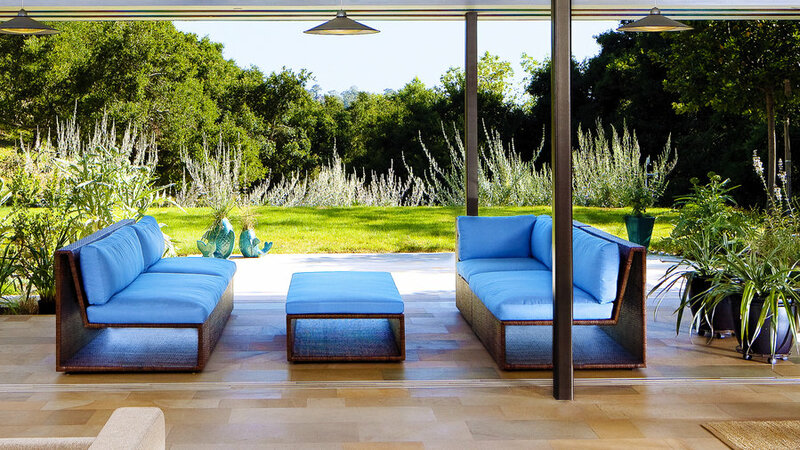 “Don’t buy it!” was architect Ken Radtkey’s reaction when his then-girlfriend, Susan Van Atta, was considering the 1-acre parcel in Montecito, California. 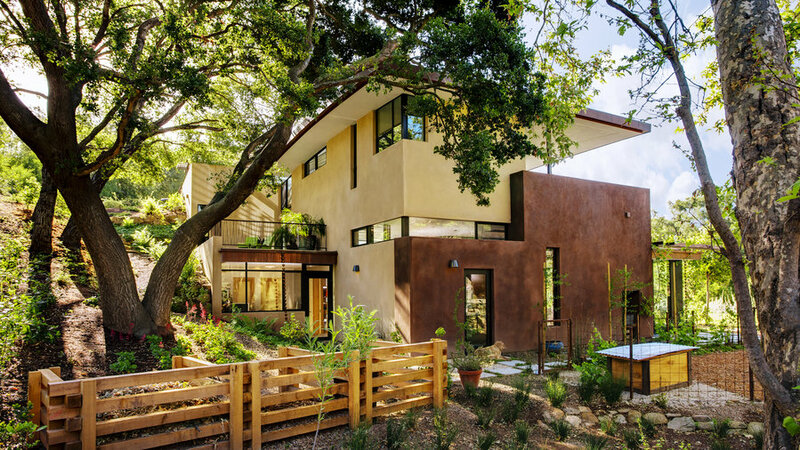 “The place was a mess,” admits Van Atta, “But as a landscape architect, I could visualize what it could become.” After living there for a few years, the couple married and turned the property into their dream home—one that’s sustainable from the plantings to the rooftops. The decision to maximize energy efficiency came easily. “The home was a laboratory for all the things we hadn’t gotten the opportunity to do with clients,” says Van Atta. 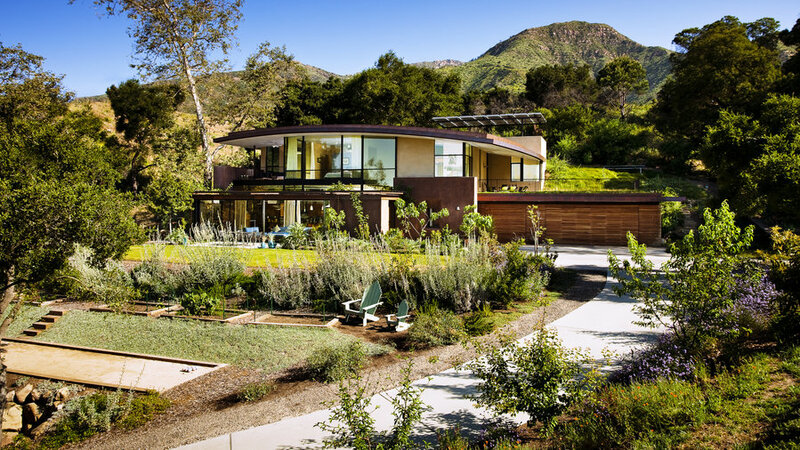 Setting a portion of the 2,500-square-foot house in a slope provides natural insulation and blends the structure with the surrounding hills. Solar panels supply all the electricity; fire-resistant green roofs are part insulation, part water collectors. Soft curves, such as this roofline, are a signature of Radtkey’s architectural style. But the roof’s sweep also helps harvest rainfall. 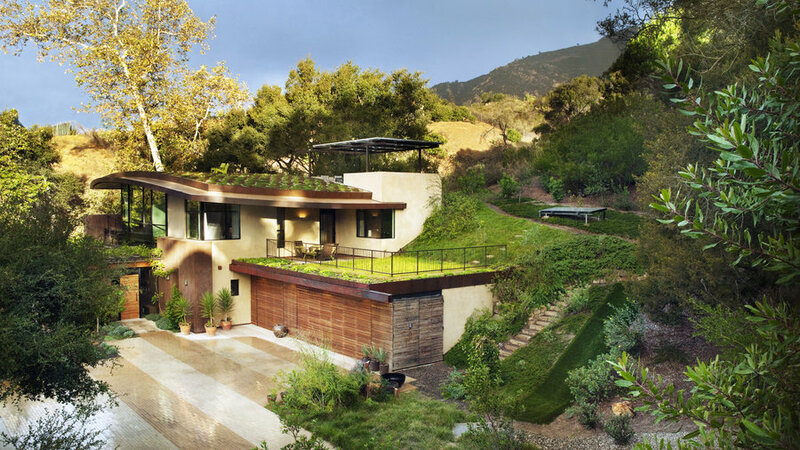 Water spills from the main roof onto the garage roof meadow, and drips via gutters to a series of underground cisterns that can store up to 10,000 gallons of water. Bonus: The photovoltaic solar panels shade an outdoor room. Two sliding glass pocket doors—one between the living room and the veranda, the other between the veranda and the garden—allow the family to vary how much they open the house to the outdoors. The screen mimics curtains and the lightweight furniture allows the space to be converted easily. “The house looks and feels larger than its square footage because we have so many outdoor rooms," said Van Atta. 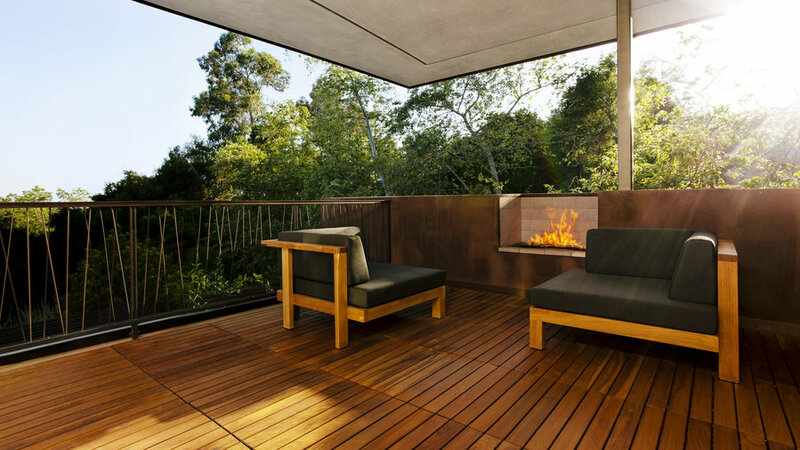 In the winter, when both sliding glass doors stay closed, the space between becomes a solar collector, says Radtkey. “It gets warm enough to heat the whole house.” The flooring throughout the downstairs, continuing onto the veranda, is saw-cut salvaged Santa Barbara sandstone. “That’s the stone you expose when you grade here, so it looks completely at home,” Van Atta says. 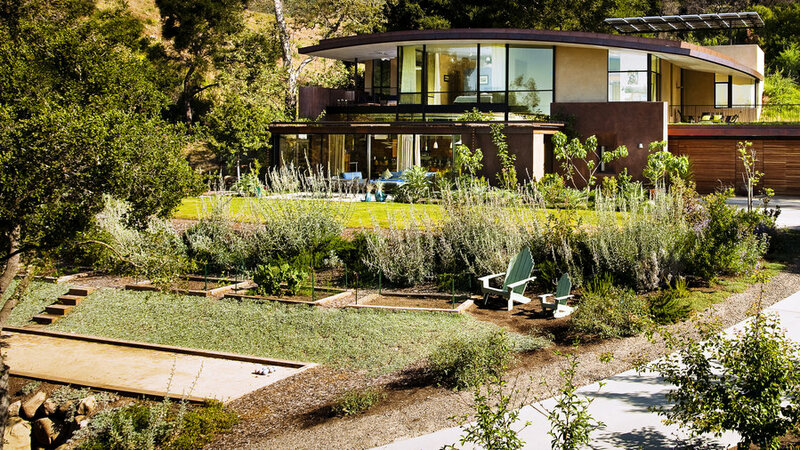 Most of the home’s sustainability comes from low-tech ideas practiced for centuries. For example, a stairway acts as a flue for warm air to rise up and out, and cool air to circulate (an effect called stack ventilation). 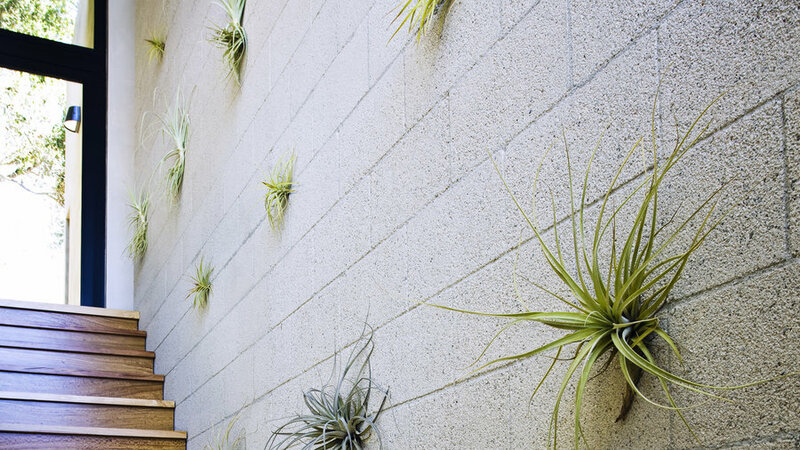 As a modern touch, air plants are mounted to the concrete walls. Throughout the yard, Van Atta chose low-water natives, including Fragaria vesca (woodland straw­berries) and Santa Barbara honeysuckle, which benefit birds and pollinating insects. The lawn is watered by below-ground irrigation to minimize evaporation. “Plants should earn their irrigation,” she says. 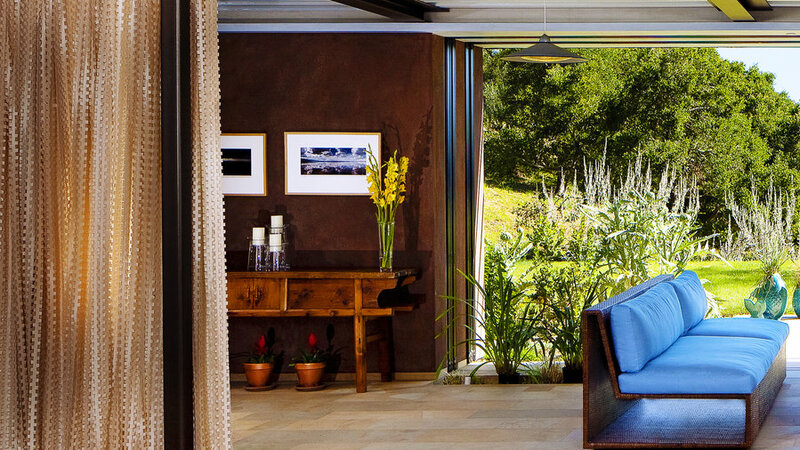 Strand bamboo cabinets blend in with the eucalyptus and other natural materials in the home. The upper cabinets are suspended to keep an open kitchen. Radtkey wanted to extend the time the family could spend on the master bedroom terrace—Van Atta uses it for yoga and the family likes to dine out there—so he installed a small gas fireplace. He prefers it to a wood-burning outdoor firepit because the energy use is limited. “It’s better to have gas, turn it on, enjoy it for 20 minutes, then turn it off,” Radtkey says. The plot just outside the kitchen door works hard but looks good. Van Atta designed the triple-bin composter to mimic fencing and planted grapevines to train up the chicken corral. 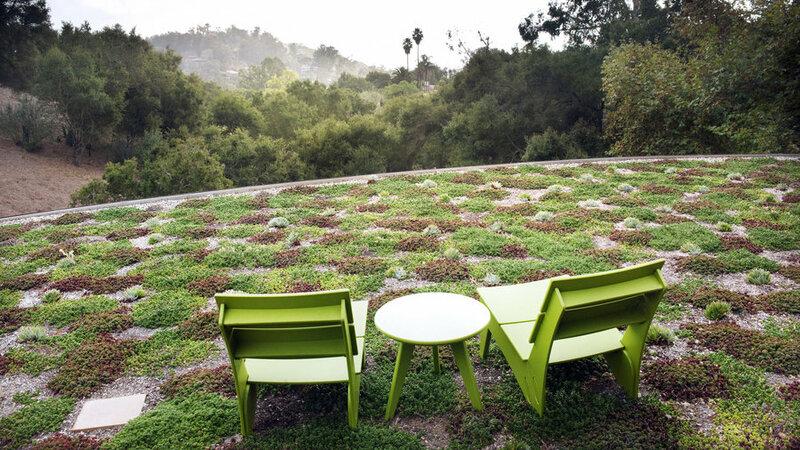 Sedums in contrasting colors turn the roof into an elevated garden with an ocean view. They also regulate the home’s temperature. “If it weren’t planted, this roof would be 20° hotter in the summer,” Van Atta says.